Banks are major providers of the mortgage loans that help many Americans achieve their dreams of homeownership. In 2017, the dollar value of one-to-four family mortgage loans made by the banking industry grew by 3.4 percent to total $2.1 trillion. Banks have remained a constant supporter of the housing sector; however, constrained supply and rising prices have led to new challenges in the mortgage sector. In 2017, home prices across the nation approached peaks last seen before the most recent housing boom. The median home price of an existing home rose 5.8 percent, while the median new home price rose 4.7 percent. Home prices rose three times faster than inflation and two times faster than income growth, suggesting a growing affordability challenge. This rise in home prices has largely reflected tight supply chains—too few homes for sale, too few lots on which to build and too few workers available to build them. Housing supply measures attempt to provide an indication of the size of the for-sale housing inventory relative to the number being sold. Today’s measure of 5.4 months indicates a tight housing supply market. The number of existing homes available for sale reached an all-time low in December 2017, bottoming at 1.48 million units—equating to a 3.2 month supply. 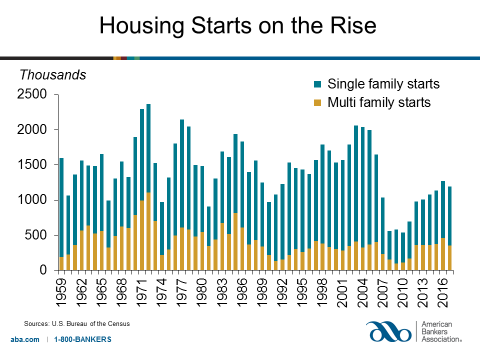 And while housing starts have begun to rebound since the dramatic drop-offs of 2007-10 (led by single family housing starts), demand continues to outweigh the market supply. Pent up demand for homeownership drove sales in 2017. New home sales rose solidly for a gain of 8.3 percent, while existing homes sales made a comeback, rising 1.1 percent over the year—the strongest year of growth since 2006. Banks have continued to make mortgage loans available as a service to their communities, despite burdensome regulatory hurdles. They actively serve rural communities—where almost a quarter of the U.S. population resides—often providing not only mortgage loans, but also a broad array of financial services. While community banks represent the only banking presence in almost 1 out of every 5 counties across the nation, regulations improperly tailored to their size and business models have hampered their ability to serve their communities. In such circumstances, nonbank mortgage services have entered—exponentially growing mortgage debt over the past few years. Independent mortgage companies and affiliates of non-depositories together hold a 51 percent market share in rural areas across the U.S., and a 59 percent market share in urban areas. Early 2018 data suggests the trends of 2017 are continuing in the housing sector this year. In the first quarter of 2018, home prices rose more than in any first quarter since 2006, while home sales continued to struggle largely due to lack of available inventory. A healthy economy, stronger incomes and a continually improving job market has driven demand for buying a home through the first half of 2018 and demand is expected to gain momentum through the second half of 2018 despite headwinds, including a worsening affordability challenge (climbing home prices, rising mortgage rates and less additional tax benefits for prospective home buyers since the passage of the tax reform legislation). On the other hand, sales of new homes that have not yet been started jumped in April 2018, the largest jump in five months, suggesting strength in housing starts in the months ahead, which could reduce lack of inventory concerns.